New York City’s newly erected One World Trade Center has been declared the tallest building in the US, at 1,776 ft (541 m). The Height Committee of the Council on Tall Buildings and Urban Habitat announced its decision in Chicago. The previous title holder was that city’s tallest building, the Willis Tower, at 1,451 ft (442 m). The committee ruled a 408ft needle at the top counted toward its height. Antony Wood, executive director of the committee, which is seen as the final official word on building heights around the world, said the needle counted as a permanent structure. Without that needle, the building measures 1,368 feet, well below the height of the Willis Tower, which was formerly known as the Sears Tower. Both skyscrapers fall well short of the world’s tallest building, the 2,723 ft (830 m) Burj Khalifa in Dubai. One World Trade Center was built on the lower Manhattan site of the iconic Twin Towers, which were destroyed in the terrorist attacks of 11 September 2001 along with other buildings in the World Trade Center complex. More than 2,000 people were killed there. 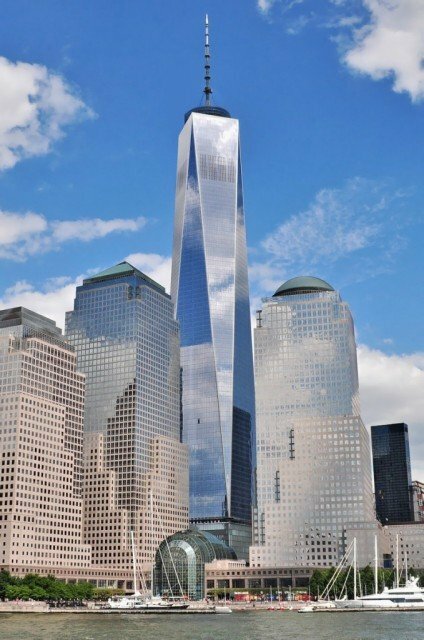 One World Trade Center ‘s height of 1,776 ft is a symbolic reference to the year of the signing of the US declaration of independence from Britain.